My name is Gemma Currie and I’m an apprentice on the Civil Service Fast Track Apprenticeship Scheme. I started working at DfT at the beginning of January as an Associate Delivery Manager. I joined at an exciting time, close to the start of DfT’s End User Compute (EUC) Discovery, and was lucky enough to be a member of the Discovery team. EUC Disco, as we sometimes call it, is an entirely Agile project and follows the discovery, alpha, beta, live lifecycle. EUC is the technology and software we use every day to carry out tasks, including desktop PCs, laptops, web applications, phones, screens, IT support and so on. The aim of the discovery was to establish the aspects of DfT technology that were preventing people from working at their best and come up with a set of needs that could be taken forward into the Alpha stage of the project. Lunch box packed and Oyster Card in hand, I made my way to the Department for Transport office in London for the first time. I was feeling slightly nervous when I walked through the door but this didn’t last long as, before I could say ‘scrum’, I was thrown head first into a series of Agile training sessions. Little did I know, these would be highly beneficial for the project ahead. The sessions gave examples of the benefits of the Agile approach, familiarised me with Agile terminology, and provided a welcome grounding in this new (to me) way of working. I had never worked in this way in previous jobs so I was excited by the prospect. Trello… is it me you’re looking for? I was then immersed into a colourful world of sticky notes, sharpies and user stories! The discovery was split into two week ‘sprints’ and every day our team had a ‘stand up’. This is a short meeting to discuss what we had done the day before and what the plan was for the current day. I found this very useful to keep a track of the workload and it is a great way to keep the team talking and working together. And yes, the EUC delivery manager did make us actually stand up! He said it helps keep the meeting short and focused. I was also introduced to a very useful workflow tool called Trello. In simple terms it allows a project team to make “cards” for different tasks and move them around the board when they are being done/completed. This ensures the whole team can see what’s to do and what’s been done. As a new starter I found this very helpful as (by the third day on the project!) my face was already on some of the cards so I knew what tasks I needed to do and when. During the discovery, our team did a vast amount of user research. This was conducted in various different ways such as 1-2-1 and group interviews, drop-in sessions and attending away days. 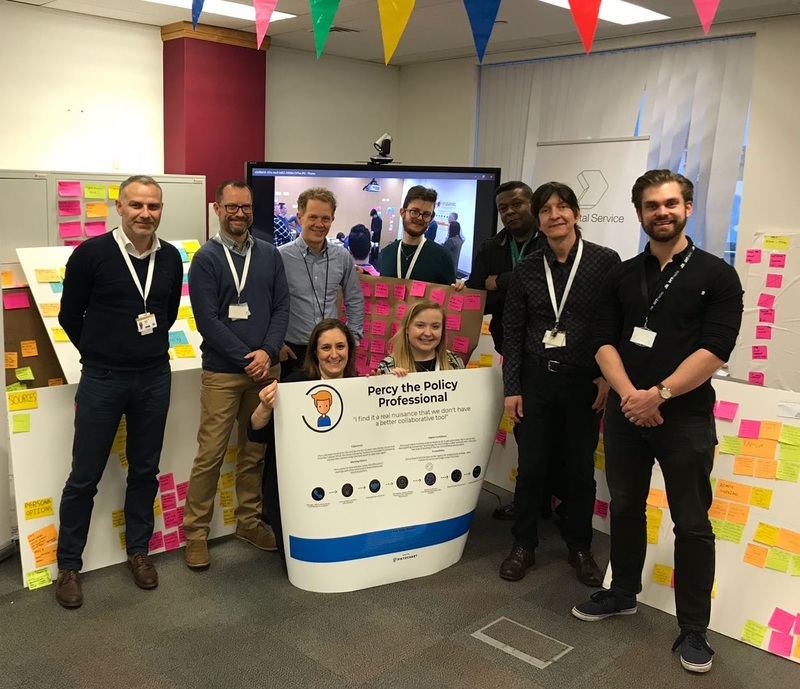 Our aim was to capture a day in the life of different job roles/groups in DfT and identify the “pain points” experienced throughout the day. To do this, we encouraged participants to write things in their own words on sticky notes, which we arranged either by theme or as steps in a process. We then took our findings, on paper and as photos, back to the office for analysis. Coming from a very rigid and desk heavy job, it has been a breath of fresh air working in this way. 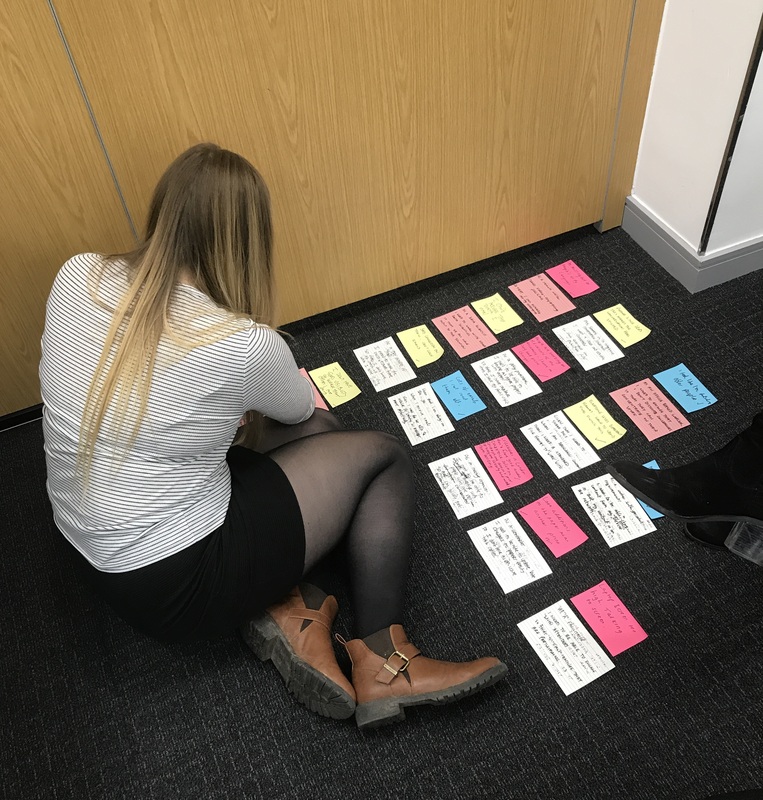 I have noticed that people are highly engaged when writing things on sticky notes as they are colourful, temporary and can be moved around, which really helps visualise what you’re working on. This is far more appealing than thousands of words of prose and made the analysis part of the Discovery a lot more manageable. During my first week I attended the Corporate Finance away day with the delivery manager and a user researcher. The event was in a quirky and colourful location near Waterloo. This was my first experience of user research and I was able to carry this through to the many more research sessions I assisted with throughout the first couple of sprints. I thoroughly enjoyed conducting the research sessions as I got to meet and talk to lots of different people which, as a new starter, is very useful and helped me build confidence. 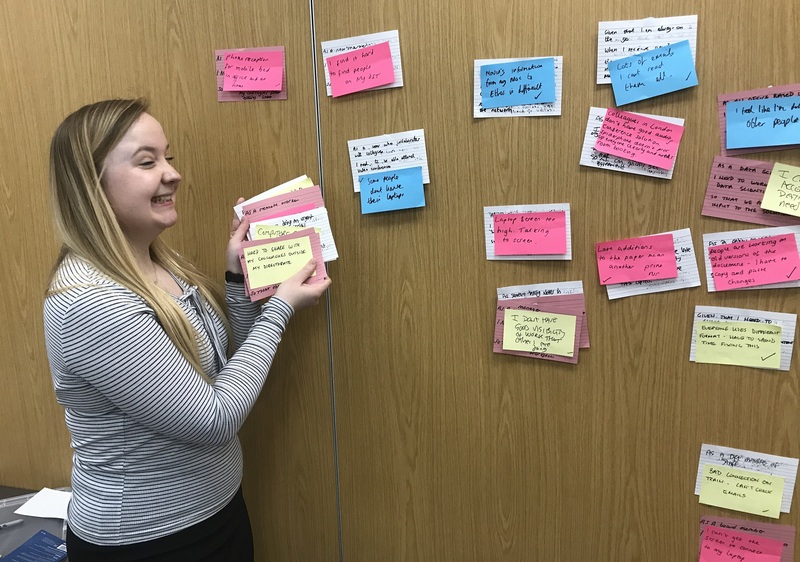 As the weeks went on, the research sessions turned into analysis and, with the help of our Agile coaches, we were able to transform the research into a set of ‘user stories’. User stories are another Agile tool which explain a requirement from the user's perspective. I have gained some very useful Agile skills on this project which I am looking forward to developing further during my apprenticeship. I was also given the opportunity to participate in Show and Tells. These occurred at the end of each sprint to highlight the work we completed during that sprint. When I was first asked to present I was quite nervous. I am a confident public speaker, although having only been in the job two weeks it is quite daunting to stand up in front of your new colleagues and perform! When I took to the ‘stage’ with the microphone, the words managed to flow naturally and I felt very relieved when it was over! The Show and Tells went down well with our wider team, so that was definitely a confidence booster for me. After an astronomical amount of hard work we have now come to the end of the Discovery phase of this project. I feel incredibly spoilt to have taken part in this project. I couldn’t have asked for a better first couple of months at DfT! Sign up here for alerts when new stories are posted. So, at the moment, we are just getting an initial idea of the kind of pain points and frustrations that the users are experiencing, so that we can identify the kinds of things that they might be looking for in the EUC discovery. What we're doing at the moment is everything's being stuck up on the whiteboards so we can have a discussion about them and try and find out why people have written certain things. And then, at the end of the day, we're going to collate all the information and analyse it ourselves. The end goal of the discovery is to find a load of themes of things that people are looking for - pain points etc - so we can work out exactly what people want and put forward some recommendations for new software or hardware for the next stage of the project, which is the alpha stage. One really interesting thing was that they'd like to have the same experience that we do in London. So, if we can find any way to make that happen, I think that would be great. Definitely a useful one. I expect we'll spend a lot of time analysing that tomorrow or today. So, yeah, really good.